Geo-Connections is the geothermal industry’s leading software as a service (SaaS) company. LoopLink® PRO and LoopLink® RLC are purpose built to make the complicated business of ground loop design fast, easy and accurate. LoopLink® PRO is simple, powerful, web-based ground loop design software commercial designers can use anywhere. You need PRO for projects with building loads that are not necessarily driven by the local weather. These buildings may have high internal gains, significant occupancy levels or large ventilation requirements that require detailed load analyses. LoopLink® RLC enables you to design loopfields for multi-zone, multi-heat pump residential/light commercial geo systems. You need RLC for projects with building loads that are primarily driven by the local weather. These buildings will have low occupancy schedules, negligible internal gains and low to moderate ventilation requirements and may be modeled using ACCA Manual J.
LoopLink® GSE allows companies large and small to access a powerful performance estimation engine without having to maintain their own models. Subscribers to the service build an interfaces that submits data including location, square footage and a few other variables. GSE looks up the location, figures out the typical local weather and estimates the energy and cost of heating and cooling the space with geothermal vs. a traditional comfort system. Geo-Connections designs software to work where you do. 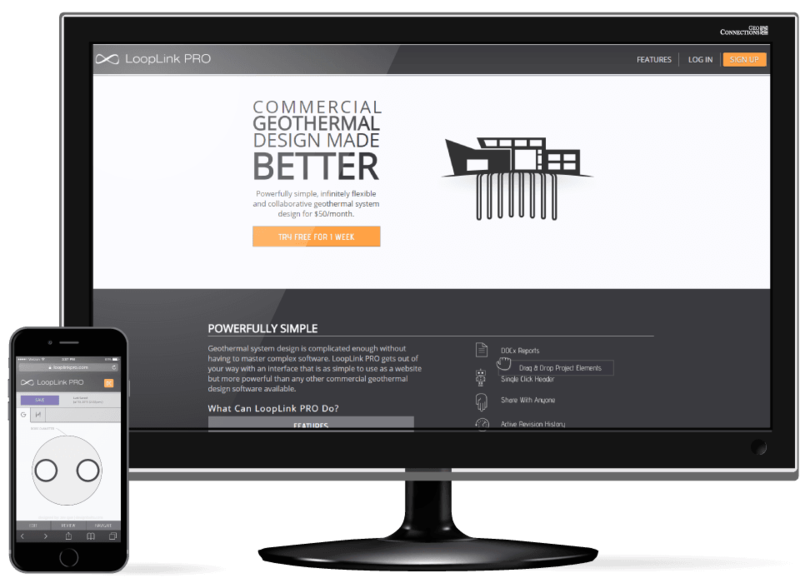 Our online subscription based software leverages the power of the internet to create fast, easy-to-use and incredibly powerful tools to meet the demands of geothermal system designers. New features, new equipment, catalog updates and other improvements appear without any action or extra cost to you. Every time you log in, you are working in the most up-to-date version of your software. Log in from your desktop, laptop, tablet or cell phone to access all of your projects and the most up-to-date version of your software. Windows, iOS, Linux, Android, OS X... it doesn't matter. Geo-Connections . All payment transactions and information are handled by our payment processors using industry best practices and modern cryptographic encryption methods. Your payment information is never stored on our servers. Your projects are backed up in multiple data-centers on redundant drives throughout the U.S. because when hard drives fail, tornados hit or offices get broken into, it is nice to know that when you put the pieces back together, there are some parts of your life that will just be there for you. Geo-Connections' expert support staff can quickly work through problems with you. If you find a bug, our support staff will pass it off to our development team and in most cases, a fix will be found, tested and released to our servers within hours not months.